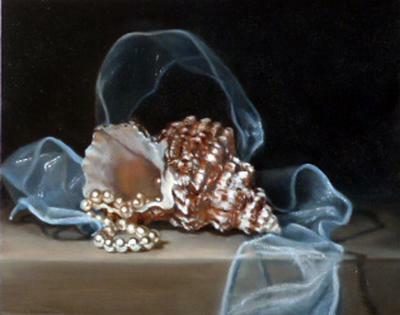 Sea Shell oil painting, titled: "Blue Ribbon Waves"
This was the first painting I did from life (rather than photo) - it took more than a week to find the right composition and light! I began working on the set up in mid-September and finished the painting mid-November...time lapse was due to drying time between layers as well as my crazy schedule which doesn't always allow for daily painting. The painting is 8x10 on smooth finish ampersand gesso board. Thanks so much Delmus for your lessons which I constantly refer back to when I'm painting!